After spending the latter of last week attending the 2018 Awwwards Digital Thinkers Conference, we’ve whipped up the moments that resonated the most through our collective experiences. 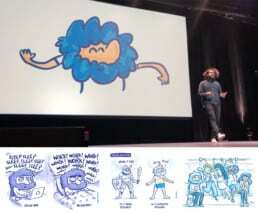 Pablo’s humorous animations and illustrations on designteam.io and the enthusiastic breakdown on creating thoughtful UI animations was yummy designer candy. Let animation point people to the right path, guide them, or help them. Create movement that makes sense, is tactile, and feels like the real world. Celebrates moments of the user journey and expresses brand style. Ryan Carson of Treehouse shared an inspiring project they’ve been working on over the past year, with the goal of opening up the door to women and people of color into the tech space. We’re strong believers in if you always pick the person with the most experience, you’ll always end up with the same kinds of people that have always been given those opportunities. Lysandre Follet, Nike’s Director of Generative Design, motivated us with the unlimited design potential of the generative design space. Instead of months and weeks, new shoe prototypes are being created in hours. Instead of creating a shoe mold at one size and scaling up and down from there, Lysandre showed how they are now creating custom patterns and forms for each size. Makes sense to us! Dana inspired and entertained us with insights on how to gain confidence as a designer (and person). She reminded us that most people, whether client or creative, deal with ‘imposter’ syndrome. Based on the work of over 100 employees, Claudio Guglieri’s presentation was a research-driven look into Microsoft Fluent design. It didn’t feel like a commercial, just a beautiful retelling of thousands of hours of work and research at the intersection of design and technology. How to maintain those human qualities within new technology is a very important design challenge that we dig into everyday at MJD. Overall our team would recommend the Awwwards Digital Thinkers Conference. Whether looking for inspiration, new tools, or just validation that you’re already doing it all right :), this is a good one. We left feeling creatively charged and thankful. Interested in learning more about what inspires our user experience and design team?